The Standing Stone: Guest Post: "Oweynagat from Torch Lights to Structured Light - Tracking interest in the 'Cave of Cruachan' from antiquarian interest to scientific survey." By Gary Dempsey. Guest Post: "Oweynagat from Torch Lights to Structured Light - Tracking interest in the 'Cave of Cruachan' from antiquarian interest to scientific survey." By Gary Dempsey. Oweynagat, ‘cave of the cats’ (fig1) is the name of a collection of monuments located in the Rathcroghan Complex, Co. Roscommon. An uninviting subterranean feature links to a natural cave which appears in numerous stories of ancient Ireland as an entrance to the Otherworld, and the home of mystical maleficent creatures. 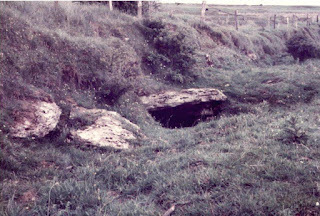 Early annalistic references to the cave are further embellished by local folklore, together making this site one of the focal points of the Rathcroghan Complex. A local folktale first recorded in 1779 by Gabriel Beranger, which is still recounted today, tells of a woman who was pulled through the cave at Rathcroghan, while leading a calf by its tail, emerging at the caves of Kesh on the Roscommon and Sligo Border (Wilde, 1870 p.136). 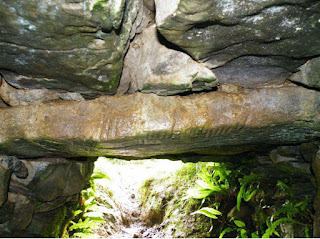 The cave is a natural limestone feature, one of a small number located within the north Roscommon region (Hickey, 2010). North of Oweynagat a number of open fissures appear which extend into closed caves. These natural fissures were ‘formed by solution in static or slow moving water... [and]... are simply expanded joint fissures, [of which] there may be numerous other examples beneath the [surface]’ (Fenwick and Parkes 1997, p.13). Oweynagat is recorded as being 37m in length with a man-made passage replacing the original descending entrance leading to a tall open space, the cave narrows again towards the rear with a buildup of clay. There are two pools of waters in the cave, one at the centre and one at the rear; this seems to be the location of a possible spring which feeds both pools. The fissure likely continues for some distance, as spaces beyond the modern limits of the cave which are now filled with clay (Waddell et al, 2009. p.88). The first recorded visit to the cave was that of Gabriel Beranger who visited the area in 1779 on a sponsored tour of Ireland, and later wrote a description of the cave (Wilde, 1870, p.247). Charles O’Conor had previously mentioned the site in his Dissertation of the History of Ireland as the ‘great cave’ of Drum Druid or Rathcroghan (O’Conor, 1767, p.178). John O’Donovan also visited the site in July of 1837, giving a brief description of the interior (Herity, 2010, p.55). Evidence marking the presence of the Ordnance Survey team survives at the end of the long clearway before one enters the cave proper. A benchmark, located on a small lip to the right can still be clearly identified today (fig2). In 1864 Samuel Fergusson gave the first written description of the external monuments described as ‘the remains of a tumulus of about twenty yards in diameter’ (Fergusson, 1866 p.162). He further explained to his readers that there were ‘traces of several internments... about the margin of the tumulus; and one nearly perfect sepulchral cist exists’ at the site (Fergusson, p.163). In a separate publication on the cemeteries at Rathcroghan, he again raises the issue of burials at Oweynagat, classifying the site as a ‘minor cemetery’ that had ‘its mounds and chambers’ like that of Relig-na-Rí (Fergusson, 1979, p.117). R. R. Brash (1879) gave a similar description in his account of a visit to Rathcroghan in 1852. 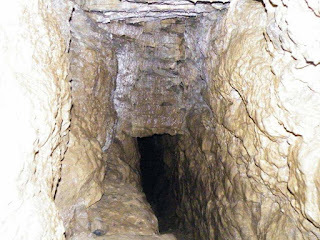 Identifying the entrance to the cave on the site ‘of a nearly erased tumulus, [where he] saw what appeared to [be] the entrance to one of those rath chambers’ (Brash, p.301). He further attested to the existence of ‘the remains of ruined Cists, one nearly perfect being still standing at the western rim of the tumulus’ (Brash, p.302). 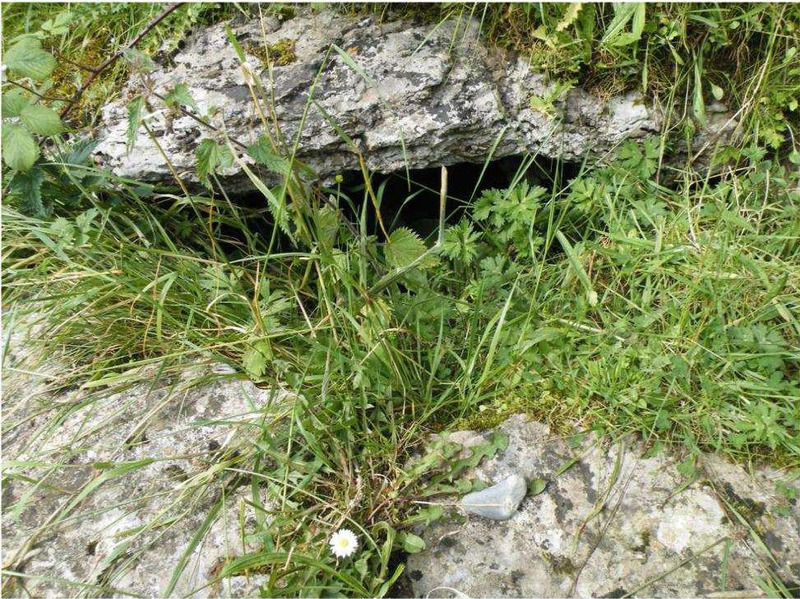 This ‘Cist’ may be the small feature which appears to the left of the modern entrance to the cave. A chamber is marked by two exposed stones, which may have once been part of a larger single feature. Waddell et al. 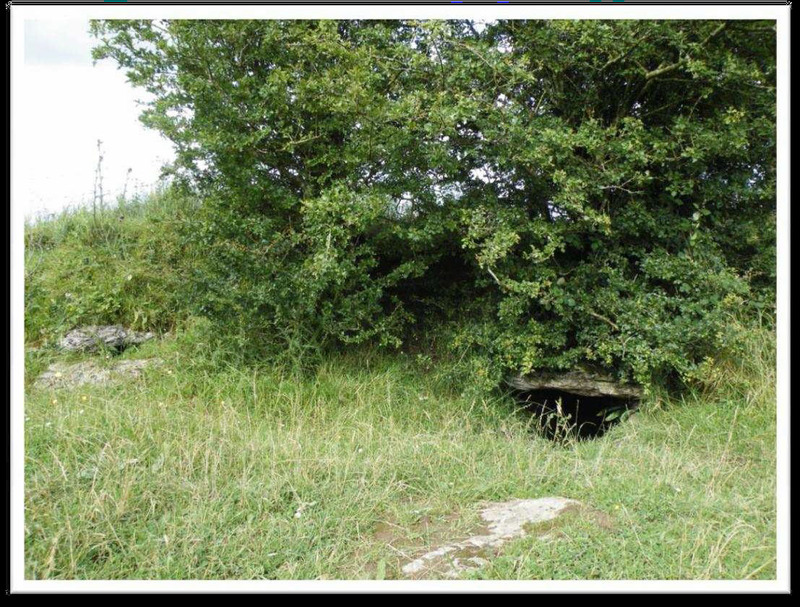 (2009, p.80) have identified this as a possible third souterrain (T9) and its entrance (T10) (fig3) which has been illustrated by Kevin O’Brien in Heritage Guide no. 22, as a small chamber capped by two lintel stones and a drop entrance similar to that of the main feature. The feature enclosing the cave is classified in the Sites and Monuments Record as RO022- 057028 – Earthwork. Michaeal Moore (2010) noted that the site was ‘described as a mound (diam. C. 20m) with the entrance to [a] souterrain in the interior.’ noting that ‘it is not visible at ground level’. A further record alludes to the burials, in the area. RO022-057031 – Redundant record. Here Moore (2010) notes that there was a record of ‘burials in the SMR’ and states ‘there is no evidence of burials at the earthwork or reference to them’. Local tradition holds that the area in front of the cave was the site of burials (Pers. Comm. Aidan Dempsey). It is possible that this assumption grew out of a mixture of National Monuments restrictions placed on framing practices in the area and interaction with visitors to the site, who repeated printed references to burials to their young local guides. Archaeological Survey - Seeing Beneath the Ground. The ArchaeoGeophysical Imaging Project (NUI Galway) carried out an extensive geophysical and remote sensing survey of the Rathcroghan Complex and noted that it is possible with ‘some degree of confidence’ to identify the enclosure as a 17m internal and 21m external feature defined by a low bank of c.2m wide. (Waddell et al. 2009, p83). While Ferguson’s work was primitive in survey techniques, nevertheless Waddell (et. al. 2009, p81) note that it does hold up ‘remarkably well’ with those planned in the modern survey. Internally the entrance to the cave resembles a souterrain (fig4). A topographical survey of the area suggests the ‘possibility of still more souterrain passages and chambers in the immediate vicinity’ to the modern entrance. (Waddell et al, 2009, p.82.). 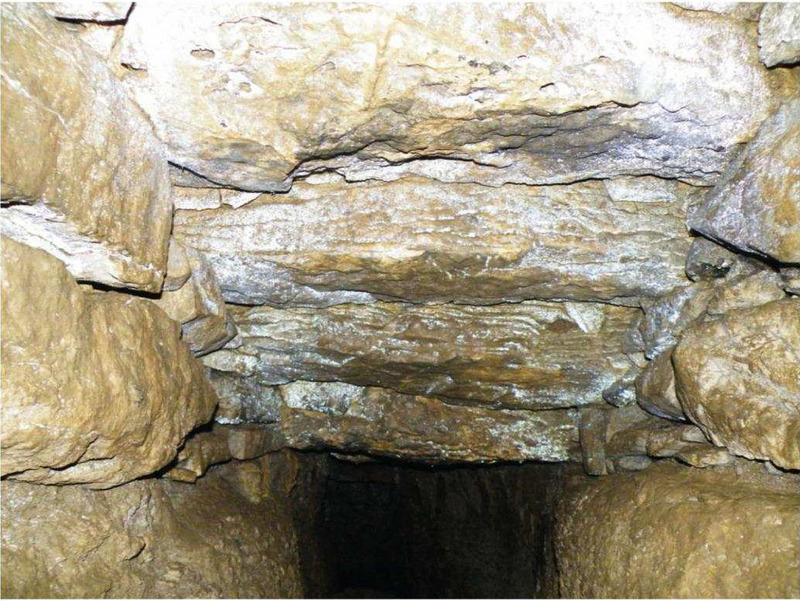 It appears from a reading of Waddell that there may have been two entrances and a number of creepways which lead to the entrance of the cave (fig5). It is important to note that the 'modern' entrance to the cave, may not be the original entrance, but rather a side chamber at an important junction within the cave, marked by two Ogham stones (pers. comm. John Waddell, Joe Fenwick). Written in Stone - Ogham. 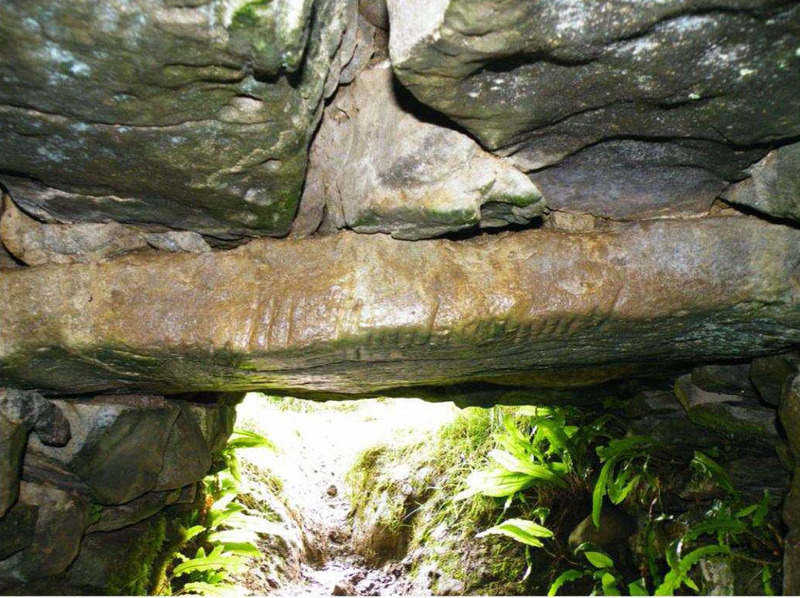 Much of the writing on the cave has concentrated on the two Ogham stones located with these passageways. R. R. Brash was the first to discover an Ogham inscription at Oweynagat in 1852 (Brash, p.303). Although it was not until Samuel Fergusson spoke on his - or rather his wife’s - discovery of this and a second Ogham inscription in 1864 that interest in this site increased with a number of articles attempting to translate the inscriptions (Fergusson, 1896, p.47). 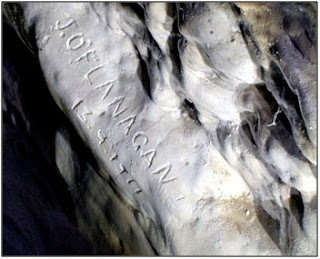 The first inscription (fig6) identified as the most internal of the lintel stones in the roof of the present entrance has been translated to read ‘FRAICCI MAQI MEDFFI’ or Freac son of Medb (Waddell, et al, 1999 p39). 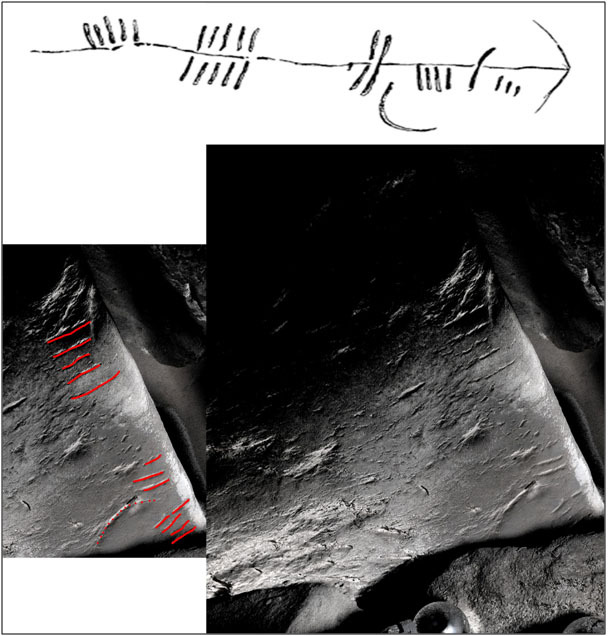 A collection of transcriptions and interpretations of the Ogham inscriptions of the cave are included in the TITUS (Thesaurus of Indo-Germanic Texts and Speeches) project overseen by Prof. Jost Gippert of Johann Wolfgang Goethe University which is available online (click here). Waddell also includes a brief bibliography of the inscription and various views as to the authenticity of the name Medb in the Rathcroghan book (Waddell, et. al. 1999). The second inscription discovered by Fergusson in the right transept after the entrance, has been recorded with a possible reading QU REGASMA (Waddell, et al, 2009 p.40). The location of this stone makes the inscription hard to decipher. 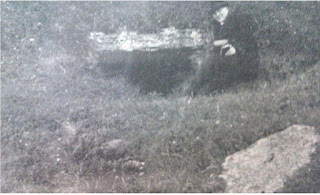 John Rhŷs was present at an excavation of the souterrain in 1897 when an attempt was made to read the second Ogham stone. Similar to other antiquarian endeavors of the time in the Rathcroghan complex, there is no detailed report of the work, and only a short description of the event was presented by Rhŷs (1898, p.230). An image of the excavated stone does exist however and was republished by Waddell (p.41). 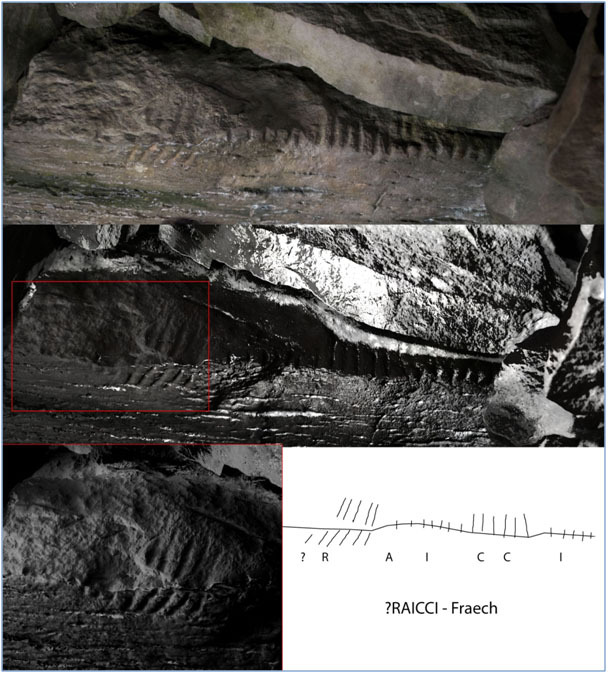 Generally dates given for Ogham in Ireland range from the 4th to 6th centuries AD, from this one can deduce that the present entrance to the cave cannot date before this period. It stands that one can date the construction of the modern entrance from the middle of the 8th century AD through to the first half of the 13th Century AD from the dates given for souterrain development (O’Sullivan & Downey, 2004 P.36). It is clear from reading the various descriptions of the features form Owneygat that the monument has changed over the centuries. Ferguson and Brash wrote of an enclosure with a tumulus and cists, while later visitors to the site only note the two souterrain entrances. The monument was drastically altered in the 1930s with the introduction of a small road and housing in the area. The house nearest to the cave was my grandparents home, and having grown up with stories of the cave I can say that there was such a reverence around the cave that the only alterations in the past 70 years have been made at the entrance to the cave where the soil has eroded away from the number of visitors to the site. A photo taken at an unknown date prior to 1924, shows a man sitting at the entrance to the cave (fig7). This image is interesting as it shows the site before the road was built and gives more detail than the published photos from the excavation of the site in 1897. The entrance sits in a small hollow, while there appears to be a ridge behind the lintel stone. Fig 14. In the 1980s. Shining a light - New Survey of the monuments. 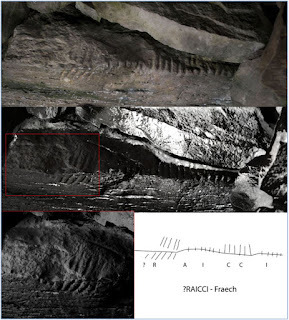 During the same Summer a second survey focus on graffiti and carvings within the cave using Reflectance Transformation Imaging (RTI) and Photogrammetry. 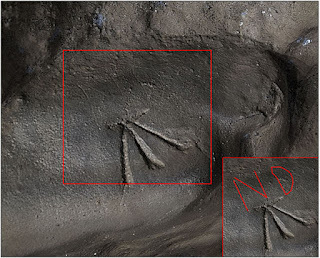 These two digital camera based recording method are important tools for the recording and identification of carved heritage object, producing low cost interactive models of features which can be examined using freely available software. Reflectance Transformation Imaging was initially developed by HP Labs for use in computer graphics, but quickly was adopted by heritage practitioners to record carved object. The methods uses a stationary camera and a reflective black sphere to record the position of moving light source. The resulting images can be used to generate a 2D image on which the lighting conditions can be altered to reveal hidden carvings. Photogrammetry is the term used to describe the generation of 3D images from a series of digital photos. The resulting 3D objects can be manipulated reveal different features hidden beneath the texture of the an object. Allowing for the removal of texture and altering of light sources. 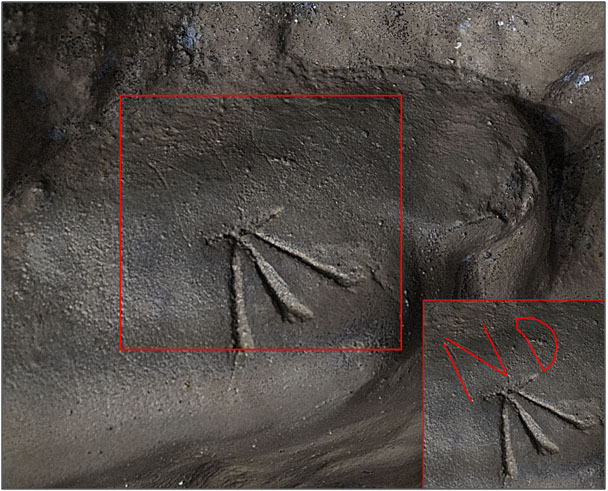 The ability of these two methods to record worn carvings and reveal details within the dark area of the cave proved useful in recording the names and graffiti at Oweynagat. Aside from the Ogham inscriptions at Oweynagat, visitors have left their mark on the cave wall. Many of the names represent locals who may have attached their names as children marking the distance they were brave enough to descend to. Along the creepway of the soutterain just as the ground is cut into a series of steps and cave entrance narrowed by the placing of lintels across its face can be found an Ordnance Survey Benchmark and beside this the name J. O’Flanagan, possibly a reference to a local landowner who lent his name to a monument to the east of the main mound. A deal of time was etching his name into the rock on the 13/09/1911 (fig8). 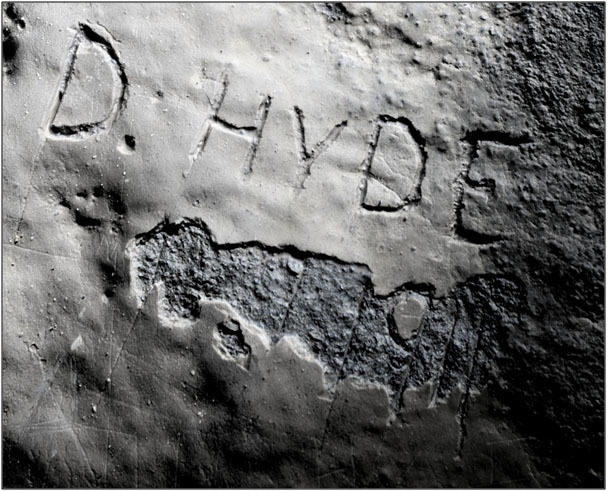 Moving through a small gap in the natural rock, D. HYDE (fig9) appears on the right hand side of the cave wall, a tentative suggestion would be that this was made by the hand of Douglas Hyde, first president of Ireland, who lived a few miles away in Frenchpark. This is accompanied by a possible date which has been damaged over the years but may be similar to that of Mr. O Flanagan’s. Other names and marks line the immediate wall to the left and right as one enters the cave, a few brave men wandered further into the dark to make their marks in this mysterious space (figs 11 - 13) Progressing further, a small of pool of water blocks the progress of those who have not prepared appropriate footwear. It is at this point when standing at the centre of the cave and searching along the beams of light from a hand held torch that strange markings (fig 10) begin to appear to the curious eye and the mysteries of Oweynagat begin to unfurl in the most imaginative of imaginations only the brave dare to venture further into the darkness and through to the Otherworld. For some entering Oweynagat is like travelling backwards in time through a monument where the function has changed over the centuries. Crossing the invisible boundary of the outer circular enclosure symbolizes moving between this world and the other and peering into the small hole in the ground evokes similar emotions as peering into the abyss. Passing under the Ogham inscription, turning into the long slender tunnel is like moving tentatively into a veil of darkness. Progressing slowly, along the narrow passage, feeling along the centuries old stone work cut by some unseen hand until the more natural ruggedness of the natural fissure rock emerges from the previously smooth wall. Looking backwards a sliver of golden light illuminates the chamber at the entrance, while small slivers of light struggle to creep along the smooth stone capped roof of the passage which was once an open scar in the face of the earth. Reaching the end of the narrow capped passage and descending a number of small steps images of past visitors to the cave emerge in the dim lamp light. As one feels their way through the darkness a sense of vastness opens before you, where the mysteries of this monument interweave with the vespers of ancient myth lingering in the air. Brash, R. R., (1879) The Ogham inscribed monuments of the Gaedhil in the British Islands (ed G. M. Atkinson). Condit, Tom & Moore, Fionnbarr (2003) "Oweynagat – The Cave of Cruachain: an entrance to the Otherworld in County Roscommon" in Archaeology Ireland, Heritage Guide No. 22. Hickey, C., (2010) "The Use of Multiple Techniques for Conceptualisation of Lowland Karst, A Case Study from County Roscommon. Ireland" in Acta Catsologica, Vol 39, issue 2, pp.331-346. Herity, M, (2010) Ordnance Survey Letters Roscommon – Letters relating to the antiquities of Roscommon containing information collected during the progress of the Ordnance Survery in 1837, Four Masters Press. Feis Committee, (1924) Iris Leabhar na Feise Moire - Rathcroghan. 20 - 21 July 1924. Fenwick, J. & Parkes, M. (1997) "‘Oweynagat’, Rathcroghan, Co. Roscommon, and associated karst features’", Irish Sepeleogy, No. 16, pp.11-15. Ferguson, Lady (1896) Sir Samuel Ferguson in the Ireland of his day, William Blackwood and sons. Ferguson, Samuel, (1879) "On Ancient Cemeteries at Rathcroghan and Elsewhere in Ireland (As Affecting the Question of the Site of the Cemetery at Taltin," in Proceedings of the Royal Irish Academy. Polite Literature and Antiquities, Vol. 1, pp. 114-128. Moore, Michael (2010) "Archaeological Survey of Ireland", National Monuments Service, available online http://www.archaeology.ie/ArchaeologicalSurveyofIreland/#d.en.12841. O’Conor, Charles, (1767) Dissertation on the History of Ireland – to which is subjoined, A dissertation on the Irish Colonies established in Britain, G. Faulkner. O'Sullivan, Muiris & Downey Liam (2004) "Souterrains" in Archaeology Ireland, Vol. 18, No. 4 (Winter), pp. 34-36. Waddell, John, Fenwick, Joe & Barton, Kevin (2009) Rathcroghan: Archaeological and geophysical survey in a ritual landscape, Wordwell Books.